A little while ago Mooo.com.au sent me a box of samples of their products. They specialise in personalised children’s gifts and products. 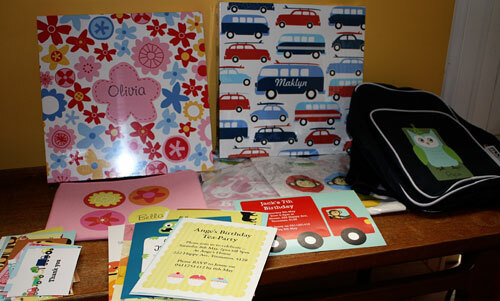 You get an idea of what they offer in the image above, ie bags, canvas art, invitations, name labels, t-shirts etc. If you have any children with any of the names you see in the image above, ie Olivia, Macklyn, Bella, Ryan, Christopher then let me know because we might be able to come to some arrangement with getting you the appropriate booty. Otherwise I’m not sure what to do with it. UPDATED – I’m getting comments from people who are visiting from a competition website who have kids with one of these names saying their child could use that particular item. If you live in Adelaide we can probably work something out otherwise I won’t be able to afford the postage. This review isn’t a giveaway as such but if I can give away some stuff without it costing me an arm and a leg I will. They also sent me a voucher to spend on their website which I have now done. It so happened that JJ needed a lunch box and now he has a personalised lunch box. Hopefully we won’t lose this one. I also needed name labels, both stick on and iron on. I had a bit of money left over so I also got a notebook with his name on the front. I found the website dead easy to use and I’m pretty fussy when it comes to that sort of thing. The images were really helpful and because you can personalise everything that aspect of typing in details then being shown an image of the finished product was really useful too. I was notified when my order was dispatched which I like, and it arrived safely and promptly. JJ at first didn’t like his lunch box but he’s a fussy whatsisname and I take comments like that with a pinch of salt. On the first day he took it to school it didn’t come home and it just happened that we had a parent acquaintance night that night. His teacher told me where they’d eaten lunch and that he’d reminded JJ to bring his lunchbox back to the classroom which JJ ignored. I walked over to where they’d eaten it and because it’s bright red with his name in big letters on the front it was easy to spot. So, go and have a look at Mooo’s website. It just might take the guess work out of buying a birthday present for a child. My daughters best friends name is Bella and I know she would love some of your stuff! Hi, My sons name is Ryan, and I know he would like anything with his name on it. loves anything with her name on it. My baby cousin is called Ryan and he is just so gorgeous! So is my Aunty Jo, they don’t have much money so it would be great to get something nice to give them. I’d be happy to pay the cost of postage to NSW. Oh and my little girl is “Charlotte” and my pregnancy will be “Mitchell”. I can’t see their names, what a shame! Thanks for reading this and have a nice day!